The NCAA swimming program has routinely been credited with the success and longevity of Team USA’s international performance. Often, the majority of elite veterans who represent the U.S. internationally earned their stripes within the collegiate sphere, frequently making their first international team either during or recently after their time as a student-athlete. Even though this has been a well-recognized trend for some time, it has recently begun to take on a different shape within the competitive swimming landscape. Whereas college swimmers mostly occupied the bottom of the totem pole on national team rosters, college swimmers are beginning to dominate the professional arena. With 2016 Olympic Gold Medalists Caeleb Dressel, Lily King and Ryan Murphy turning into “household names,” it is becoming increasingly clear that college swimmers are the future of Team USA. Naturally, the NCAA Championships have become a good indicator of USA Swimming’s competitive finesse on both the men’s and women’s sides. Not only did this year’s meets show that the college swimmers who have already established themselves internationally are continuing to swim fast, but also that an abundance of fresh talent exists at USA’s disposal. As we are almost two months away from the 2018 Phillips 66 National Championships – which serves as the selection meet for the 2018 Pan Pacific Champions and the 2019 World Championships – four breakout performers from this year’s NCAA DI Championships could potentially be in the mix for making their first major international team. 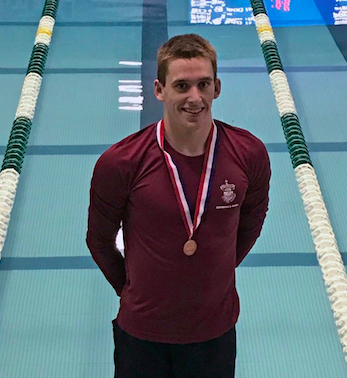 In a meet filled with many surprises and upsets, Ian Finnerty – a junior at Indiana – emerged as possibly the most shocking performer of the whole meet. He became the first man to break 50 seconds in the 100 yard breaststroke, posting a blistering 49.69. Finnerty’s new American Record was a 1.69 second drop from last year, a 51.38 from the 2017 Big Ten Championships. Prior to his national title, Finnerty had only made one finals appearance at NCAA’s, with a 16th place finish in the 100 breast his freshman year. Given his rapid rate of improvement and newfound historic success, Finnerty is likely brimming with confidence. The barrier that Finnerty shattered is significant because none of America’s current top long course 100 breaststrokers have been able to do so. Kevin Cordes – who holds the American record for the long course 100 breast with a 58.64 – came the closest to getting under with his 50.04 from the 2014 NCAA Championships. Cody Miller, Nic Fink and Andrew Wilson have all dipped into the 50-second range in recent years, but none have come within a second of Finnerty’s best. Could Finnerty become America’s next premier breaststroker? According to the Swimming World Time Converter, a 49.69 translates to a 57.37 in the big pool, which would be a monstrous 2.72 second drop from his 1:00.09 PB from last year and would near Adam Peaty’s legendary world record of 57.13. As this has always been the case in the sport of swimming, short course and long course are two completely different animals. If Finnerty could drop another 1.69 seconds like he did in yards, that would put him at a 58.40 and earn him yet another American record. A swim like that would essentially guarantee a spot on both the Pan Pacs and Worlds teams, as last year’s meet required a 59.11 to qualify in second. Additionally, considering his high stroke rate and favoritism towards the 100 over the 200, we could very likely see Finnerty in the mix for a spot in the 50 breast. Bottom line: don’t be surprised if you see Finnerty’s name a lot come July. He already came out of nowhere once – let’s not miss him again. Perhaps the most unheard of swimmer on this list prior to this year, Tennessee’s sophomore Erika Brown has established herself as a force to be reckoned with in the college swimming domain. At the 2018 SEC Championships, Brown became the second woman to break the 50-second barrier in the 100 fly with a 49.85. Moreover, in the 400 medley relay, Brown split a 49.11 – the fastest split in history. Despite her recent success in the event, Brown has never pegged herself as a butterfly connoisseur; her best 100 time entering college was a 55.12 from 2016. Brown has traditionally been a sprint-free specialist: she won both the 50 and 100 freestyles at the SEC meet in 21.39 and 47.17 respectively. Interestingly, Brown hasn’t swum in a long course meet since the 2016 Olympic Trials. Her best time in the 100 fly even comes from before that – a 1:02.49 from 2015. A 49.85 roughly converts to a 56.20, a time drop that would seem impossible for anyone else but her. That time would easily clear the 57.97 that qualified for the World Championships last year. Because of her lack of experience in the big pool, it’s difficult to say how successful Erika Brown can be this summer if she goes for it – but with her meteoric rise in yards, it would be unwise to write her off. With the return of former world record holder Dana Vollmer and the recent supremacy of American record holder Kelsi Worrell, Brown will have her work cut out for her. At the same time, however, another breakout performance could jump-start her international career. High expectations were placed on Longhorn freshman Austin Katz after he posted a 1:38.49 in the 200 back at the Texas Invitational in December – the fastest time in the nation going into the championship season. At NCAAs, Katz did not disappoint: he took home a national title in the 200 back with a 1:37.53 to become the fourth fastest performer of all time. He also took 4th in the 100 back with a 44.99. Katz boasts a 2.07-second drop in the 100 back and a jaw-dropping 4.21-second drop in the 200 back from his high school bests (47.06 and 1:41.74). His 200 back time is right off of what American record holder Ryan Murphy went his freshman year when he won the title in a 1:37.35. Murphy would go on to win both backstroke events for four years straight at NCAAs and to become a two-time Olympic Gold Medalist in both the long course backstrokes. Despite setting himself up for a collegiate career akin to Murphy, Katz is by no means in a solid position to contend for a slot on a major international team this summer. As history has dictated, it is in America’s prerogative to have an incredibly deep backstroke field. Former Cal teammates Murphy and Jacob Pebley have reigned supreme in the 200 back for the past two years, and the 100 back seems to be firmly occupied by both Murphy – who currently holds the world record – and Matt Grevers, the 2012 Olympic Champion. The 200 back seems to be Katz’s best shot. If Katz were to drop another 4.21 seconds from his best time, he’d finish with a 1:52.99, which would surpass Murphy’s best time of 1:53.62, which won him the Olympic gold. Considering the fact that Murphy’s best time in yards is a 1:35.73, a swim like that seems unlikely for Katz. Anything in the 1:54-range, however, could put him right in the mix. Pebley went a 1:54.78 to take the second spot on the World Championship Team last summer. Given Katz’s unprecedented trend of improvement and the fact that his long course best time is from 2016, an upset isn’t out of the question. Whether or not he makes a team this summer, Katz is poised to contribute to the historic American backstroke legacy in the future. At the 2018 Women’s Big Ten Championships, Wisconsin’s sophomore Beata Nelson became the second fastest performer in history in the 100 back with a 49.78. Prior to breaking this legendary barrier, Nelson’s best time was a 51.67 from 2014, when she was sophomore in high school. After four years of plateauing, 2018 was a major break-out year. Later on at the NCAA meet, Nelson would post a 1:49.27 in the 200 back, certifying herself as the seventh fastest performer in history. Nelson’s long course bests stand at 1:01.66 and 2:13.33 in both backstroke races. The 100 seems much more up Nelson’s alley, which required a 59.11 to make the World Championship Team last year. A similar 1.89 second drop would put her at a 59.77, which would likely put her right on the cusp of a major international team selection. With the current preeminence of Olympians Kathleen Baker and Olivia Smoliga, making a USA Swimming World Championship team is probably out of the question. A Pan Pac spot is possible, as they sometimes take the top three swimmers as opposed to just the top two. Whereas this summer might not quite be her time, Nelson is due for a breakthrough in meters. Coming into next year as the NCAA title favorite in the 100 back, we could see a primed and confident Beata Nelson leave her mark on the international rankings in the coming years, if not earlier.